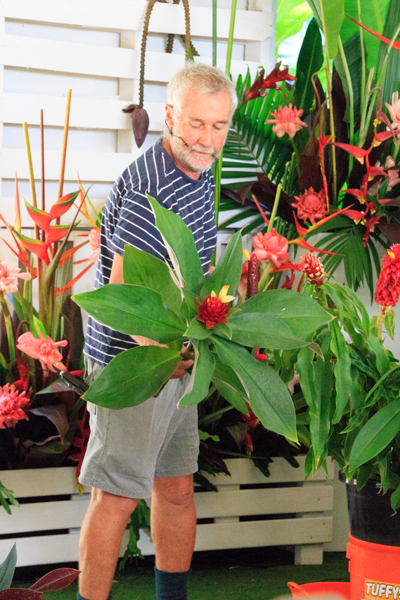 At the markets this Sunday you will find us behind a splash of colour from the freshly flowering Heliconia champneiana ‘Splash’. 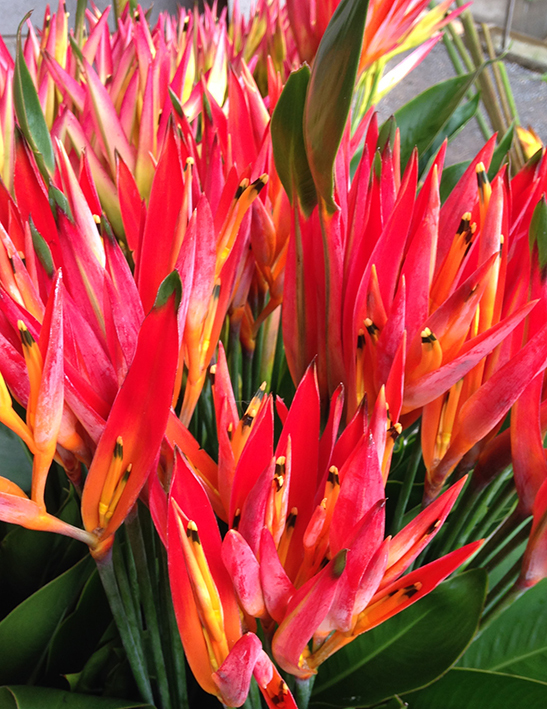 We also have bucket loads of psittacorums creating a riot of colour. 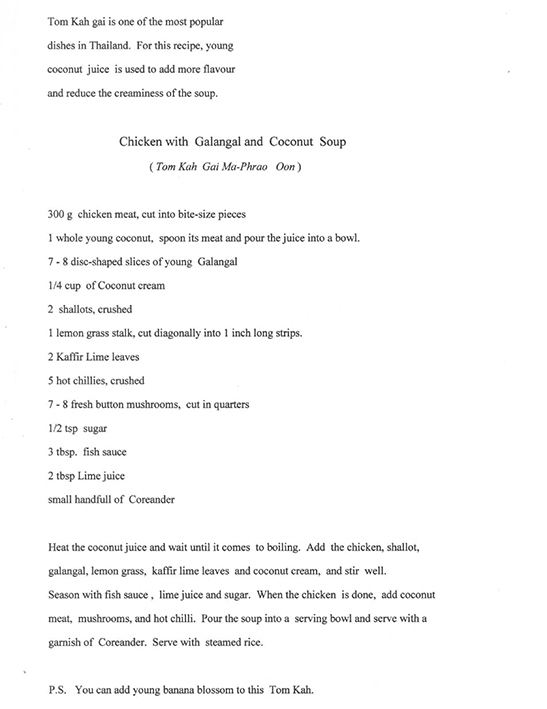 On the last day of the Ginger Festival we were lucky enough to receive instruction from Siriwan, or Chef Boo as her friends call her, the Thai chef of the well known Cottontree restaurant “Thai Mango”. 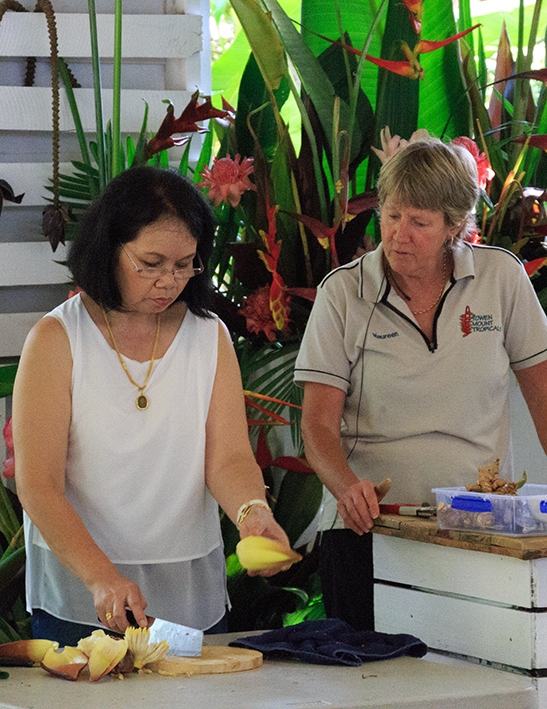 She demonstrated how we can prepare, cook and store a number of different gingers including ginger, galangal, chinese keys, turmeric, torch ginger flowers and a relative to the ginger family, the banana flower. 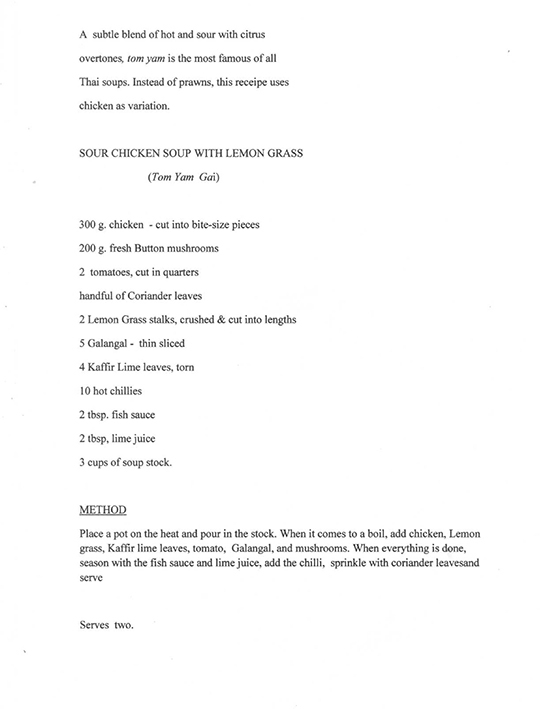 Chef Boo also provided a number of her Thai recipes using these various gingers. 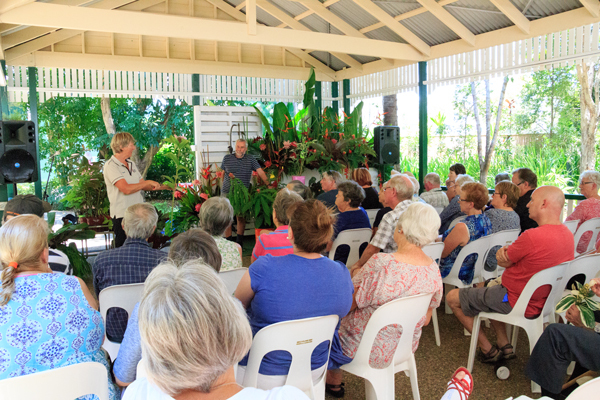 Well today was our first day at the Ginger Festival at the Ginger Factory in Yandina, where we launched Greg Jones’ new hybrid cold hardy costus series to a packed audience. 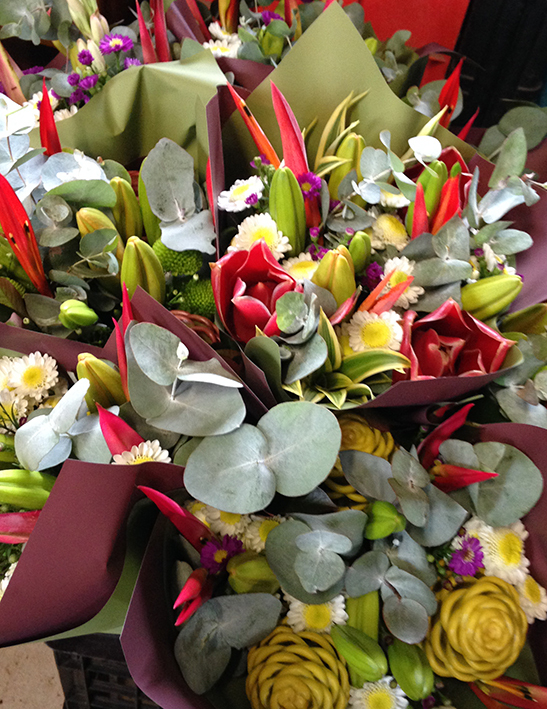 Our plants are walking out the door with many customers inspired to add gingers to their garden. 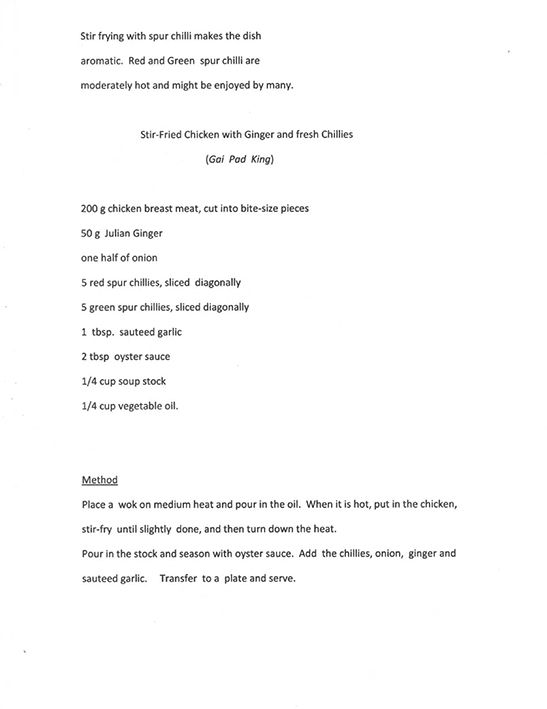 Come and see us on Sunday at 2.30pm when we will have Thai chef extraordinaire Siriwan or Boo as her friends know her demonstrate how a variety of edible gingers are prepared, stored and cooked in her home country of Thailand. 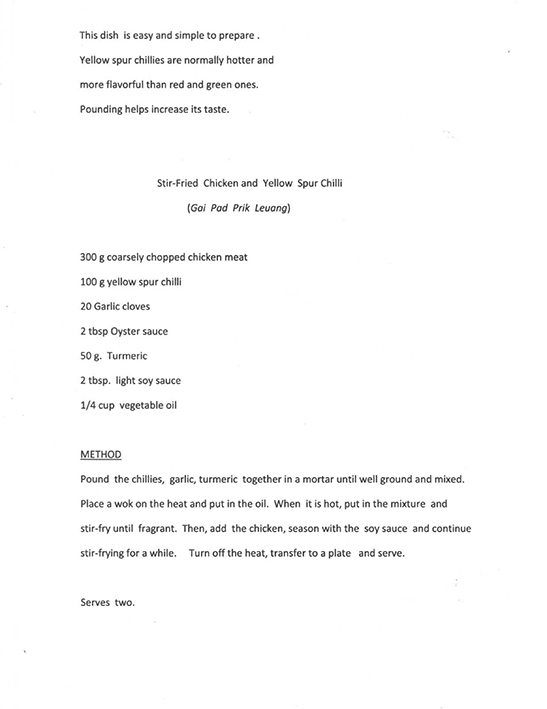 She now is the chef at the very popular Thai Mango restaurant in Cottontree and will share some of her recipes with us. 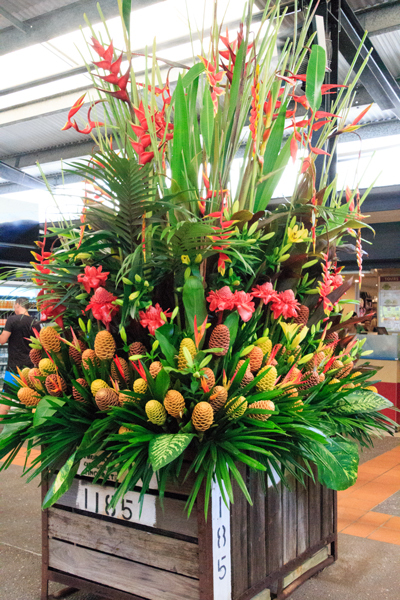 The 2016 Ginger Flower and Food Festival is almost upon us, and we are busy delivering thousands of plants that will be for sale at the Ginger Factory in Yandina. Please come and visit us from Friday 22nd until Sunday 24th January – that is next weekend! 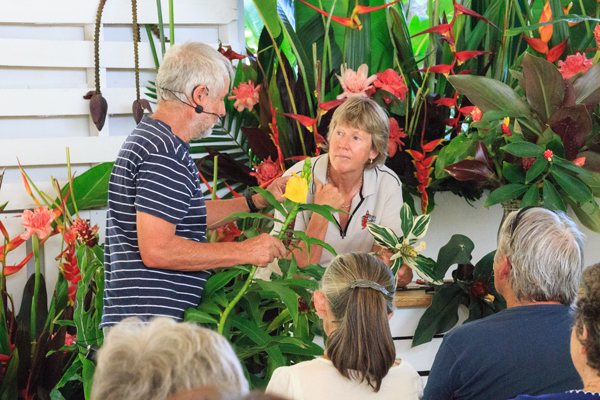 I will be launching a brand new range of compact cold hardy costus with Greg Jones on Friday at 11.30am and on Sunday at 2.30pm I will be talking about edible and medicinal gingers – how to grow, harvest, store, prepare and cook them. 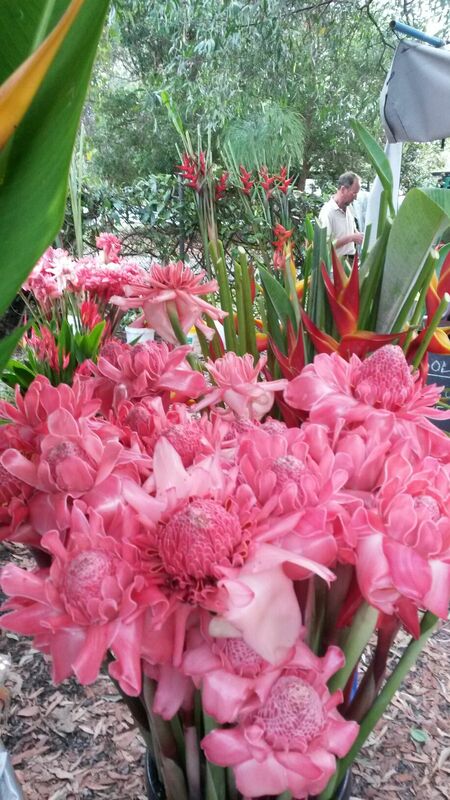 One of the new costus being launched is a gorgeous compact hybrid developed by Greg called ‘Midori Magic’. 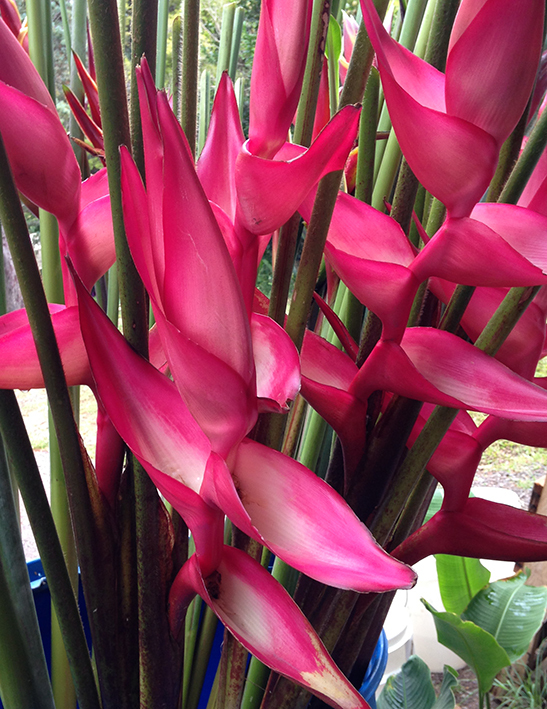 Tomorrow Sunday 17th Jan is market day again at Noosa Farmers Market and yet again we have heaps of bright gorgeous flowers for sale including the last pickings for this year of the gobsmacking gorgeous lipstick pink Heliconia bourgaeana. 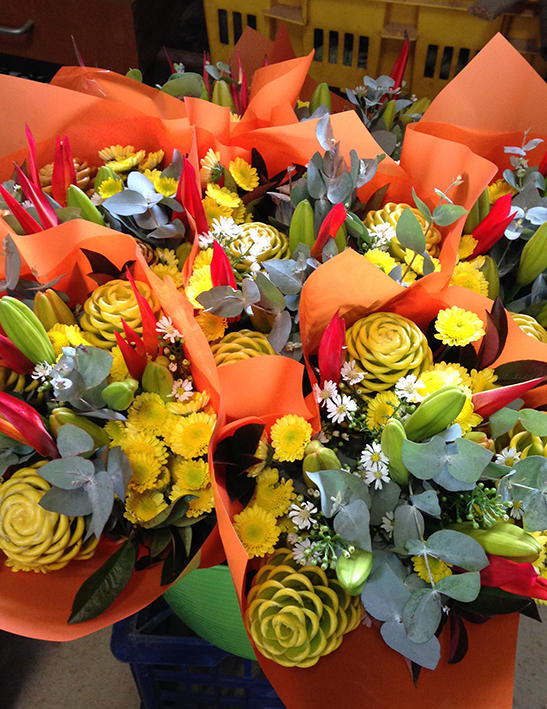 Our mixed bunches are as colourful as ever and we have bucket loads of psittacorums which will last for ages in a vase. 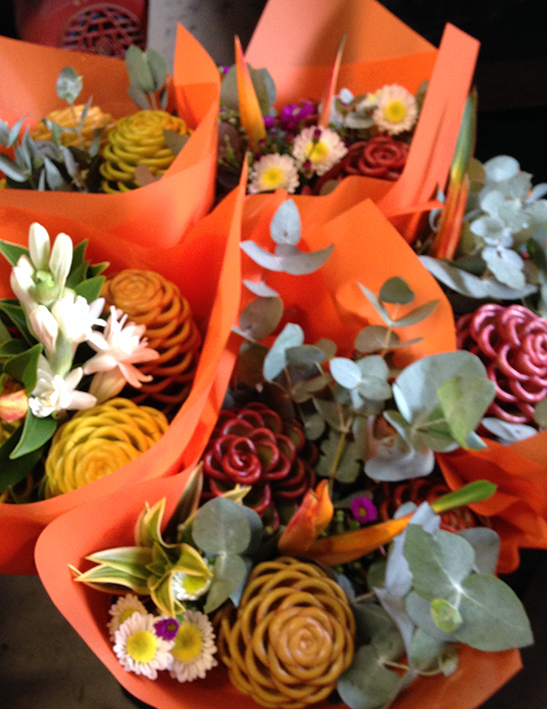 Torch gingers are flushing at our farm on Towen Mountain so come and see these beautiful flowers at the Noosa Farmers Market this Sunday. 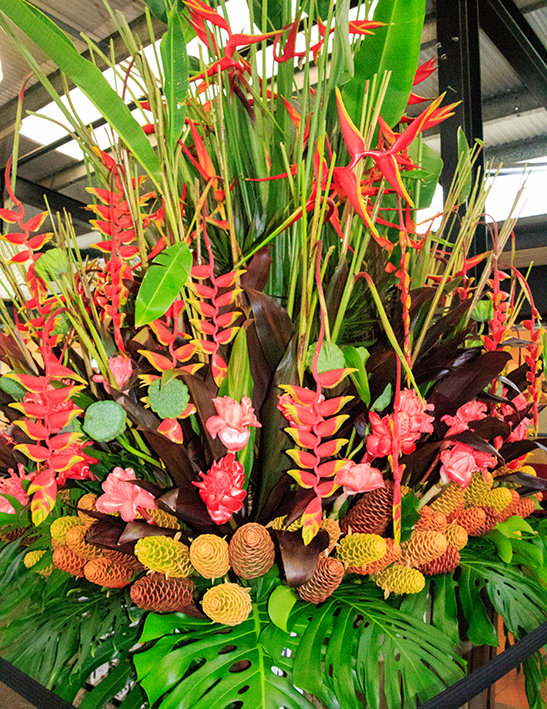 Don’t miss out on our presentations at the Food and Flower Festival at the Ginger Factory in Yandina 22nd-24th January. 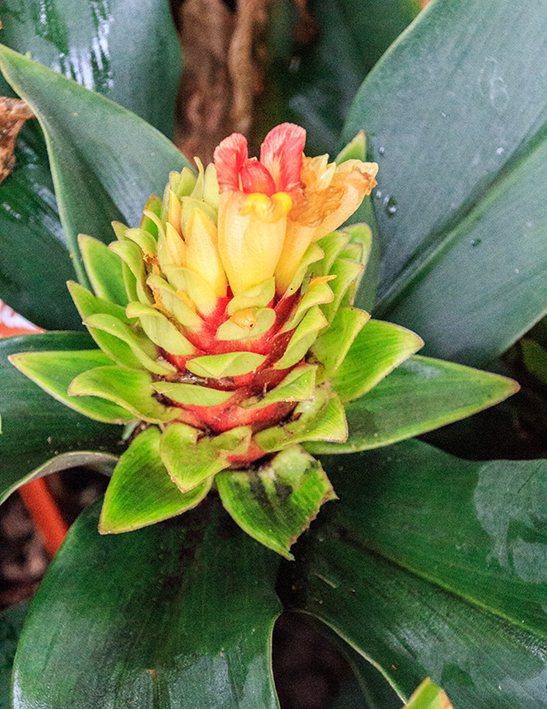 We will be releasing some new cold hardy costus gingers and talking tropicals. Count down is on for the next HSI conference and this year promises to be the best ever. The xv11 conference will be held in El Valle de Anton, Panama at hotel Los Mandarinos- 2 days of presentation. 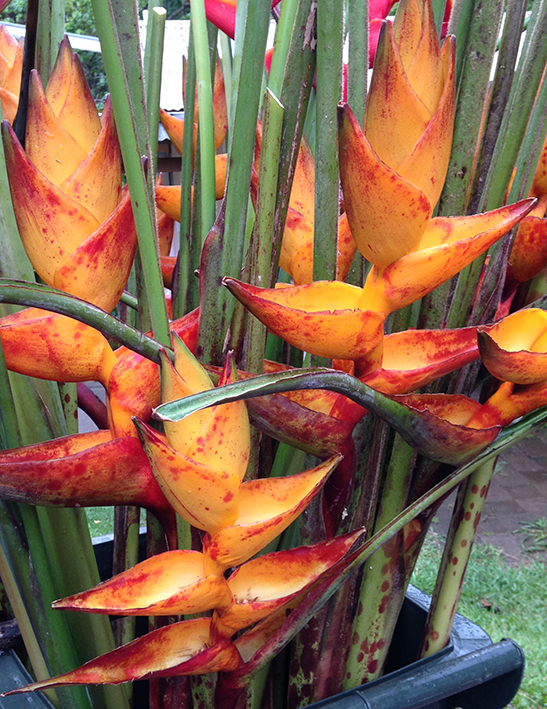 The pre-conference tour will take in gardens in western Panama and Costa Rica- 4 days 3 nights. After the conference we will be heading south to Columbia starting in Cali and finishing in Medellin – 8 days in all. A huge thank you for Carla Black for organizing this conference ! !